One of the unique features of VMOD Flex is the ability to work with multiple numerical models inside a single project. Unlike other modeling GUI's, VMOD Flex does not restrict you to a single model scenario or single grid for your model. 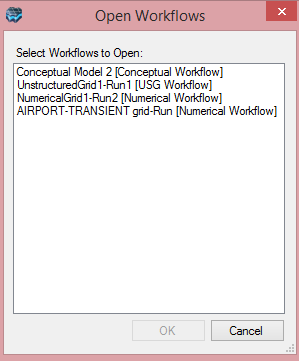 With the workflow based approach, you can generate multiple grid realizations from your conceptual model, each one with one or more model runs. Likewise, you can import multiple MODFLOW models or Visual MODFLOW projects into a single project, and analyze and compare these projects. •You have Imported a MODFLOW or Visual MODFLOW project, immediately after creating a new project. •When you are within the Conceptual Model workflow, upon running the Conceptual to Numerical Model conversion. 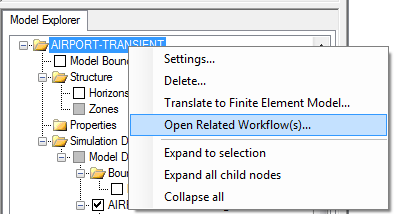 Each new workflow will load as a separate window inside the VMODFlex main application window. The windows can be accessed from the window toolbar at the top of the screen, as highlighted in red below. The tree structure for multiple model runs is shown below. 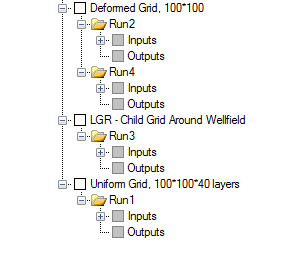 Each numerical grid (which is derived from a conceptual model) can have one or more model Runs; each model run contains the inputs and output for a single numerical model. 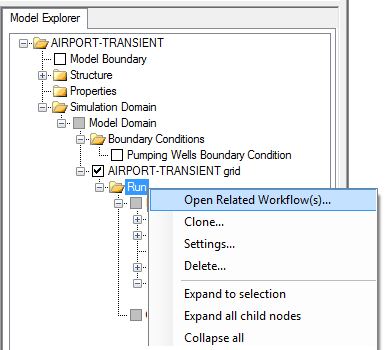 You can close a workflow window at anytime by selecting the X button in the top right; however, this is only recommended if you do not need the workflow window until a later time (for example a specific model run). Select the desired workflow(s) and click [OK]. In addition, you can load a specific workflow through the model.